Roll roofing is the perfect material for the novice roofer or DIY homeowner who wishes to finish a shed or porch roof that has a slight sloped roof or a flat roof. Produced in large rolls that are cut and nailed into place, DIY rolled roofing installation is incredibly simple and can be completed quickly. You should never install roll roofing unless it is at least 50 degrees outside — to prevent cracking. The sun’s natural heat will make the roll roofing easy to work with, so leave it on the roof for a few hours to warm up. While you’re waiting, install a drip edge all around the perimeter of the roof to prevent the water from working underneath the edge of the roofing. Normally made of plastic, a drip edge will further protect your roof and give it a finished edge. #1 – Spend some time cleaning the roof before beginning a rolled roofing installation project. #2 – Like any other roof project, you should start this one by addressing the valleys. #3 – Take a roll of 18-inch wide roofing and use it to cover the length of the valley. Attach it to the valley with roofing nails spaced 6 inches apart, about 3/4-inch from the edge. PRO TIP: Step #3 may seem like overkill, but in my experience leaks tend to occur near valleys and on the edges of the roof. Spend some time taking care of these areas and you’ll greatly diminish the chance that you’ll be up on the roof making repairs after the next rain storm. #4 – Next, place a roll of 36-inch roofing directly over the 18-inch roofing and secure it in the same manner. #5 – With the valleys covered, apply the rest of the roll roofing parallel with the roofing edge. Use a chalk line to make sure that you’re creating even rows — overlapping by about 3 inches. #6 – Nail into the side that is furthest from the edge of the roof, spacing nails every 3 inches apart. #7 – Apply the next piece of roll roofing so the overlap covers the nail heads, using roofing cement to secure the 2 pieces of roofing together. #8 – When you encounter a roof valley, trim the roll roofing so it ends 1/2-inch from the valley’s center. #9 – Then use roofing cement to secure the edges of the roll. #10 – Finally, use a 12-inch roll of roofing applied with roofing cement to run over the valley seam and cover all of the edges. 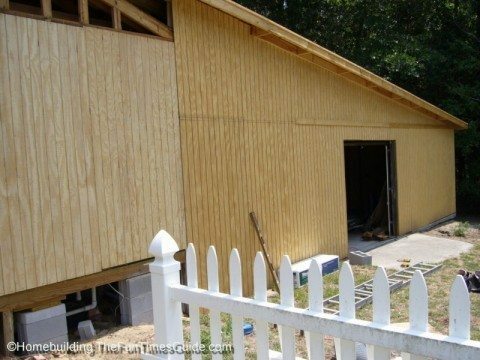 Roll roofing is a great material for small projects, but I don’t recommend using roll roofing to put a roof on a home. Instead, you’re better off choosing a more traditional material — such as asphalt shingles — which lends itself to an installation method that is better at withstanding leaks. As a first time roll roofing DIYer, you’ll appreciate this roofing glossary.